“We’re going to have a baby,” my daughter said nine years ago. I received the news with wonder, joy and trepidation knowing that we both were entering a world we knew so little about. Thankfully, some of my friends had gone before me into the domain of grand motherhood and not a single one of them relayed any message but one of complete ecstasy. A special friend sent me a package in the mail with a zip lock bag containing a ball of yarn, some needles and a pattern. 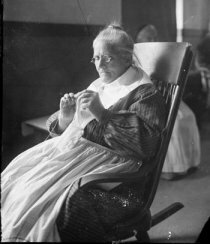 The image of a wrinkled, white-haired woman on a front porch knitting with her glasses perched on the tip of her nose and her cat curled up at her feet, quickly came to mind and frightened me a little. I pushed through my own prejudiced stereotyping and curiously examined the contents of the bag. My mother taught me to knit when I was about 12 and I remember producing long, uneven lengths of tangled color. I was completely astonished to discover that I did remember how to push the needles through the loops to get the desired result. 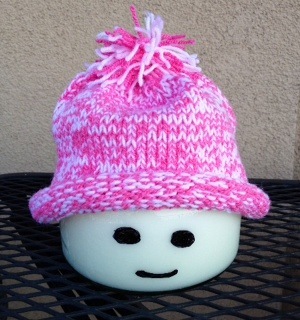 Though, I did have to call Mary a few times for a little help, I actually completed the pattern and created a tiny hat for my grand baby to come. My first little cap led to many other projects – stockings, ponchos, scarves, sweaters etc. Admittedly, most of my items were not so great and I fear my children and grandchildren wore them to bless me and took them off when I was out of sight. Worn or unworn, I take pleasure in knowing that long after the sweaters lose their shape, the caps are lost and the stockings unravel, the prayers that I knit will continue to live on. I would love to send you a little cap or better still a zip lock bag with all the goodies you need to knit one, but instead, I will give you the next best thing. With a 16 inch circular needle – size 5 or 6 – cast on 68 (72,76,80) stitches. Join ends of yarn being careful not to twist. Knit in a circle for 5 (5.5,6,6.5) inches. Put 4 markers on needles evenly spaced. Knit 2 together before and after each marker every row. You will need to change to short double point needles (sock needles) when it gets too tight. Knit until just a few stitches remain, thread a needle and pull remaining stitches through and secure inside the cap. Add a pompom. Ohhhh, what a sweetly awesome way to prepare for a new grandchild. And what a cute pattern. I can crochet fairly well, knit horribly (I always drop stitches and don’t know what to do with them) but I have a couple of daughters who are excellent knitters and some grandchildren who have followed me with crocheting and will probably start knitting soon. I’ll have to pass this on to them with the sweet idea. Thank you for a lovely visit. What a lovely post. I also started knitting and crocheting again when my daughters-in-law were expecting. Each grandchild got booties and a baby blanket. When my granddaughter was about 4, we were discussing the beautiful forest green I\’d chosen for her blanket because my other daughter-in-law thought her sister-in-law would like that color better than the traditional pink. My very grown-up granddaughter said, \”Well, that was ok for my Mom, but I would like a pink one.\” So, we went to the store and picked out yarn in Strawberry Shortcake colors and she got a new, bigger blanket. Gwen – we are excited this week (especiially my ‘great’ parents) to welcome Eden Joy Martin into this wide world… My neice now has 3 under 3, s we will continue knitting many prayers for her wee ones. I’m not a knitter, but love the image of knitting prayers & have done that for my nieces for a Very Long Time! I’ve made a few of those too because I hate sewing pieces together. Love it. Since I am a visual learner, you will have to help me learn to knit a hat before February! you got it ML. I certainly thought of you when I posted this!!!!!! Beautiful! I’ve never learned to knit but do find a similar soothing in painting and other artistic endeavors. It still my mind for contemplation and prayer too. Just lovely, Gwen. Thank you. Very beautiful and soothing post…i loved the message it shared. God bless! I’m so glad you liked it. It is very soothing to get in the rhythm of the moment.